As the food critic Florence Fabricant once said, “Hominy still has its place in American cuisine.” However, to understand what that place is, you have to begin with what it is, where hominy has been, and what we can do with it. Hominy is a dish of boiled maize kernels that, throughout most of the past, were also nixtamalized (NEESH-ta-mal-aiz-d), or prepared using an alkaline substance. This may not be the hominy you know. Like many foods, hominy has gone through many historical iterations–it has great antiquity (think 3000-2000 B.C.) in Mesoamerica as one of the first steps in making masa (corn dough) or the final product in pozole (whole kernel maize soup). Several centuries later, hominy was disseminated into the American Southwest, again as important to both masa and pozole. By A.D. 1000, an ancestral hominy foodway was being disseminated and practiced throughout many parts of the Eastern Woodlands (which includes the Southern, Northeastern, and parts of the Midwestern United States). Hominy was the primary foodstuff of Indian groups living throughout the region, and is still practiced today by many American communities. For complicated reasons, though taste is certainly included, most Europeans and Euro-Americans adopted maize but not nixtamalization (NEESH-ta-mal-i-zai-shun). This turned out to be for the worse for many. Not only does nixtamalization alter the taste of maize, but it also chemically changes the kernels, making several otherwise unattainable essential amino acids and B vitamins digestible for nonruminants, (i.e., humans and other non-grass eating animals). Thus, nixtamalization makes maize a food you can safely obtain 40% or more of your daily calories from and still live a happy, healthy life. Non-nixtamalized maize is not nutritionally complete, and a person receiving more than 40% of her calories from “raw” maize (that isn’t also accompanied by a complementary protein like beans) would suffer from chronic malnutrition. “Corn sickness” was a serious epidemic in many parts of the Old World after maize was adopted and incorporated into peasant diets, and was even an issue in the American South during the Great Depression when Euro-Americans and Americans alike, whose culinary knowledge of maize derived from the Old World, turned to maize as a dietary staple. 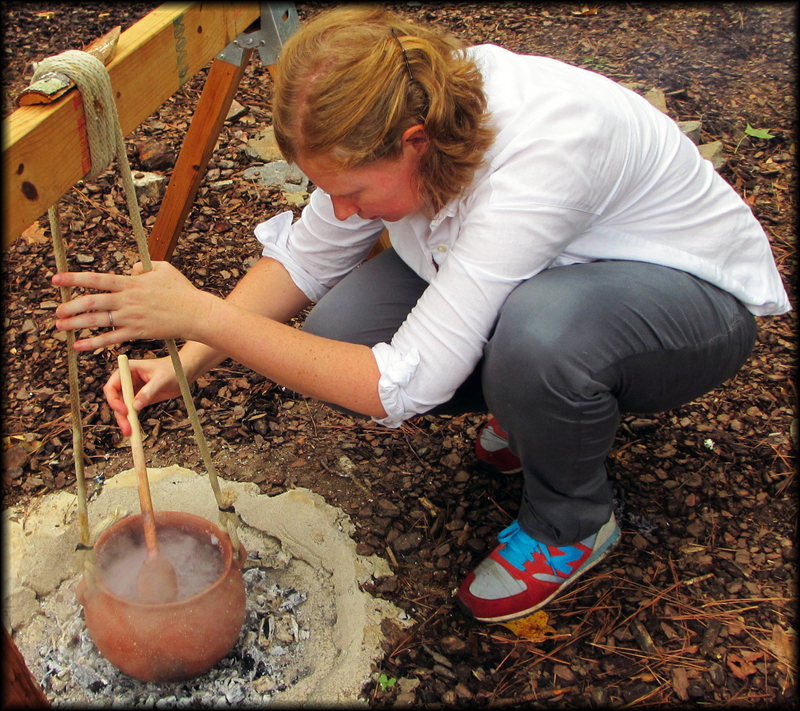 Rachel V. Briggs, making hominy in a replica Mississippian (prehistoric Indian culture in the American South) ceramic vessel. I know all of this because hominy, and in particular the hominy foodway of the Eastern Woodlands, is my career. My name is Dr. Rachel Briggs and I received my PhD in archaeology in the department of Anthropology at the University of Alabama. I am a foodways archaeologist, and my dissertation focused on the early social and culinary history of the prehistoric Mississippian civic-ceremonial center of Moundville, located in west-central Alabama. I study ceramics, cooking techniques, hominy and maize, and cultural perceptions of food. I have spent many years researching all things hominy, and perhaps the most important thing I have learned is that many people not only have no idea what hominy is, but even less know about its significant history. As a native South Carolinian with Carolinian parents, I grew up with corn–from corn on the cob to grits, to numerous summer days spent shucking, shelling, stewing, and freezing corn for the winter, yet I had no idea what hominy was until I began asking what exactly people at Moundville were eating. My research has led me to a number of interesting places: biographies and early colonial accounts, modern recipes, trendy restaurants, countless books on corn, and even my own experiments with recreating lost and as well as creating new hominy recipes. My hope is to help reignite both a culinary and historical interest in this important foodway. Hopefully, the information here will inspire you to try it for yourself, to maybe even make your own woodash lye (and perhaps weigh in on which trees have the best flavor) or grow your own heirloom flint maizes (there are so many with so many different subtle flavor and texture differences). Or, if you’re already familiar with hominy, to find new ways to incorporate this food into your own traditions. Whatever you choose to do, I hope you find something worthwhile here. Food and foodways are important aspects of all our lives, and in no way should this blog be considered an exhaustive anthology on the subject–foodways are dynamic and ever-changing, and the hominy foodway is no exception. So, if you find a gap in the knowledge somewhere, or you just have your own favorite recipe you’d like to share, please let me know! And, I hope you enjoy! I’m the producer of a science and culture podcast called Distillations out of the Chemical Heritage Foundation in Philadelphia. We’re working on a podcast about tortillas and nixtamalization and are desperately seeking an authority who can speak about the history of nixtamalization. Where/when did it begin? What were the details? Why? Even if some of these questions are unanswerable we’re at least looking for someone who knows enough to say that no one knows. Are you that expert? You certainly have an impressive blog! If you’re not, do you know who might be? We’d be looking to do a short interview, which we could do over the phone or with a sound recordist conveniently located to you, sometime in the next couple of weeks. Hi Mariel! Hopefully I just replied to your comment via email. Either way, I have no problem speaking to the history of nixtamalization, addressing where, when, and even how the practice came about. My email is rvbriggs@crimson.ua.edu, and I hope to hear from you soon. I am looking to make samp, a porridge originally made from dried, cracked flint corn. Do you know where I might be able to find such a variety? I have been growing and nixtamalizing different maize varieties for about five years now. One perplexing question I have is when I nixtamalize red corn varieties (such as bloody butcher or a native Costa Rican variety), the corn first turns bright red, then pink, and eventually black. Underneath the black coating is a yellow corn. The black outer coating is extremely difficult to remove. My ratios are 2 tbsp x 2 quarts of water x quart of corn. Reading one of your posts, I have the impression that I may need to increase the amount of alkaline to make the outer shell remove more easily. I could send you pictures to illustrate. Other colored corn varieties, such as blue, purple, yellow, have outer shells that remove quite easily after cooking for a few minutes and letting soak for about eight hours or longer. Your commentary is appreciated.